Sharp began formal studies on nonviolent struggle six decades ago in 1951, working toward his master of arts degree in sociology at Ohio State University. From then until 1955 — during which time he spent nine months in federal prison for refusal to cooperate with conscription for the Korean War — he explored the history of nonviolent action and the speeches and writings of Gandhi. Sharp started corresponding with Albert Einstein and sent the theoretical physicist his manuscript for Gandhi Wields the Weapon of Moral Power, eventually published in 1960 by the Navajivan Publishing House, which was founded by Gandhi in Ahmedabad. Einstein wrote the foreword for the small volume, calling it “a truly important work” and describing Sharp as a “born historian, in whose hands the various threads are held together and woven into a pattern from which a complete picture emerges.” Einstein later wrote that this book was the finest he had seen on Gandhi. Sharp spent 10 years in Britain and Norway, first at the University of Oslo’s Institute of Philosophy and the History of Ideas and then at Oslo’s Institute for Social Research. 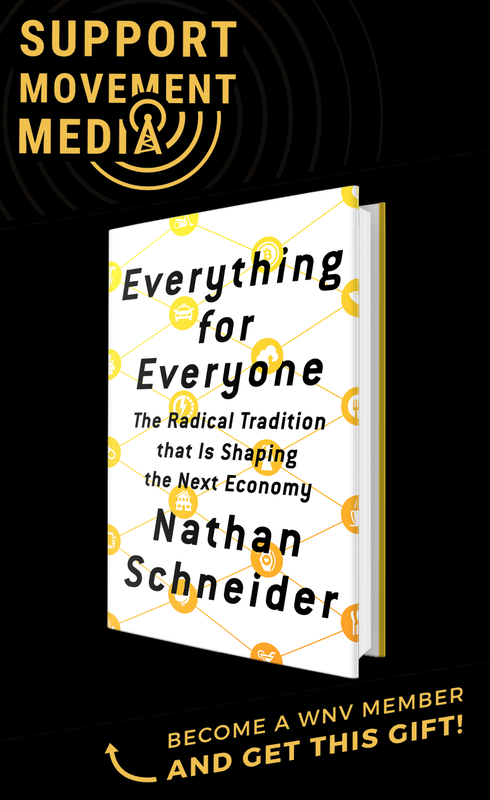 There he caught the attention of Thomas C. Schelling, a Harvard professor who would in 2005 win the Nobel Prize in Economics. Schelling invited him to Harvard. Having started on his doctorate at the University of Oxford in 1960, Sharp finished his thesis at Harvard, and in 1968 was awarded the D. Phil. in political theory from Oxford. His study emphasized theories and philosophies of the nature of political power, authority and obedience, dictatorial systems and totalitarianism, and resistance and revolutionary movements. His dissertation was 1,428 pages long. Sharp edited his thesis and in 1973 published it in three volumes, as The Politics of Nonviolent Action (also known as Sharp’s Trilogy), a sweeping historical examination of the phenomenon of nonviolent resistance. This is where his 198 methods first appeared. The Trilogy would become one of the most important, influential, and authoritative works in history on the spread of ideas about fighting with nonviolent action. Of paramount importance, he based the Trilogy on actual events, specific instances and real-life examples, while drawing heavily from the body of political theory. Both analyzing and describing the powers and properties that are fundamental to the technique of nonviolent resistance, the three volumes spread around the world from hand to hand. He has written many more books and pamphlets since then, each expanding and clarifying the field of study that he helped to shape. Just as Gandhi was confounded by problems of terminology, Sharp recognized early that the quandaries of language impeded the understanding and teaching of nonviolent methods of fighting for social justice and political change — all the more so when translation comes into play. Many languages today have no word whatsoever for this subject, including Hebrew and Arabic. Yet even in English, something so small as the decision to hyphenate — nonviolent and nonviolence versus non-violent and non-violence — is ambiguous. Hyphenating the expression further accentuates a negative connotation; without a hyphen, the word becomes a more straightforward affirmation. Since 1949, Sharp has undertaken an ongoing project of scrutinizing the predicaments and quandaries faced by anyone writing and speaking about the power of this form of struggle. The result has been a long-awaited dictionary of nearly 1,000 entries, described by the author as meant “to develop greater conceptual clarity.” This is a critically important development, because explanations of nonviolent action have often tended toward the bizarre, romantic or quixotic. (I recall a young man in Pondicherry, India, some years ago, who described civil resistance to me as “something to do with boldness.”) Despite numerous historically successful instances of major accomplishments from nonviolent action, it is regrettably true that universities, social scientists, news media, diplomats and policy makers have generally failed to study and grasp its power and the way it works; the lexicon is not well known even in closely related fields. Journalists and diplomats — whose work often brings them into contact with nonviolent conflict — do not receive training in this subject. Privately, I am hopeful that a pet peeve of mine may be positively affected by the availability of Sharp’s Dictionary, namely the vacuous phrase we routinely see in Western news accounts: “the people took to the streets.” Journalists and others write this as if it were factually explanatory, when it is actually misleading in implying that impetuous, improvisational street action is all there is to nonviolent resistance. 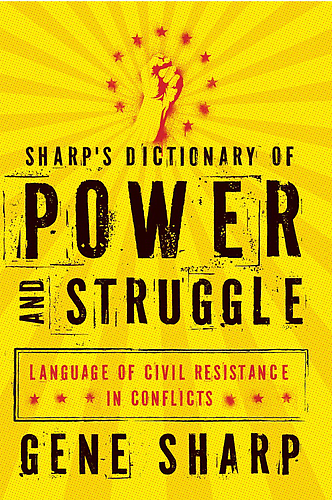 Sharp has long held that nonviolent action is actually more complex in its use of power and strategy than is military action, as this dictionary shows. I am glad to have at hand, for instance, his re-conceptualization of “sanctions.” Sharp explains that while sanctions typically refer to punishment for failure to behave as expected, and may be used specifically in the context of international relations as one nation-state acting upon another, the phenomenon actually occurs in a wide range of social relationships, including the firing of an employee or disobedience with respect to certain laws. “Sanctions may also be applied by the citizenry against the State, by certain nongovernmental groups against others, and by States against each other,” Sharp writes; “Sanctions in domestic and international politics are usually a key source of political power.” Among nonviolent sanctions used by non-state groups, he cites boycotts, strikes and civil disobedience. Finally, “A key element in the operation of nonviolent action against repressive opponents is the refusal to capitulate or submit in spite of official sanctions and unofficial reprisals.” This broadening of the word’s meaning reflects Sharp’s thoroughgoing analysis of power, which respects not merely state-controlled physical force, but also includes the power that ordinary citizens can wield through organized, strategic action. Deliberate migration from the Jurisdiction of a State as an expression of extreme disapproval because the resisters believe it to be responsible for certain injustices or oppression. Such action is a very serious method of social noncooperation. However, a protest emigration by very large numbers of people may take on the character of political noncooperation. Protest emigration may be permanent or temporary. He goes on to explain, “Voluntary emigration was called hijra in seventh-century Arabic. The term hijra derives from Muhammad’s flight from Mecca to Medina, undertaken instead of submission to oppression in Mecca.” I would add that this term, meaning “to abandon” in Arabic and employed in 622, was corrupted to hizrat when it reached India. In East Germany, the continual westward flow of East Germans to their democratic neighbors in West Germany was called “exit” and was, of course, permanent, in instances when successful. By defining words and terms non-judgmentally and with the greatest economy, the dictionary makes rapid clarification readily accessible. Having been spoiled by the intellectually provocative historical examples that suffuse Sharp’s Trilogy, I found the dictionary upon first encounter so terse that I felt deprived. Yet, as Sharp’s Dictionary spreads throughout the world, I believe that it will contribute to both the understanding and the use of nonviolent action. For now, I am certain of one thing: No other person alive today could have produced this work, and we should be grateful that he has done so. He must get the Nobel Peace Prize. His ‘Social Power and Political Freedom’ ch. 2 and ch. 12 have good insight and help for us here. We can all learn a great deal from his books. We can reclaim our country using the techniques provided. It only requires ordinary people to train and deploy for action against the target. No American in the last 10 years deserves that prize, excet Gene Sharp. The last American to recieve such a prize has disgraced it to such a degree, to such an extent, all Americans must be ill from what the president, Mr. Obama, has done to dishonor it. Apparently he’s on some people’s shortlist!